For the company, see Meltwater Group. Meltwater is water released by the melting of snow or ice, including glacial ice, tabular icebergs and ice shelves over oceans. Meltwater is often found in the ablation zone of glaciers, where the rate of snow cover is reducing. Meltwater can be produced during volcanic eruptions, in a similar way in which the more dangerous lahars form. Glacial meltwater comes from glacial melt due to external forces or by pressure and geothermal heat. 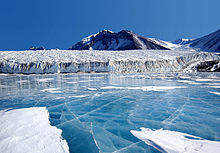 Often, there will be rivers flowing through glaciers into lakes. These brilliantly blue lakes get their color from "rock flour", sediment that has been transported through the rivers to the lakes. This sediment comes from rocks grinding together underneath the glacier. The fine powder is then suspended in the water and absorbs and scatters varying colors of sunlight, giving a milky turquoise appearance. Meltwater also acts as a lubricant in the basal sliding of glaciers. GPS measurements of ice flow have revealed that glacial movement is greatest in summer when the meltwater levels are highest. It can also destabilize glacial lakes leading to sudden floods, and destabilize snowpack causing avalanches. Dammed glacial meltwater from a moraine-dammed lake that is released suddenly can result in the floods, such as those that created the granite chasms in Purgatory Chasm State Reservation. In a report published in June 2007, the United Nations Environment Programme estimated that global warming could lead to 40% of the world population being affected by the loss of glaciers, snow and the associated meltwater in Asia. The predicted trend of glacial melt signifies seasonal climate extremes in these regions of Asia. Historically Meltwater pulse 1A was a prominent feature of the last deglaciation and took place 14.7-14.2 thousand years ago. ^ Aas, Eyvind; Bogen, Jim (1988-04-01). "Colors of glacier water". Water Resources Research. 24 (4): 561–565. doi:10.1029/WR024i004p00561. ISSN 1944-7973. ^ Garner, Rob (2013-07-22). "'Like Butter': Study Explains Surprising Acceleration of Greenland's Inland Ice". NASA. Retrieved 2016-05-12. ^ Peters, Leo E.; Anandakrishnan, Sridhar; Alley, Richard B.; Smith, Andrew M. (2007-03-01). "Extensive storage of basal meltwater in the onset region of a major West Antarctic ice stream". Geology. 35 (3): 251–254. doi:10.1130/G23222A.1. ISSN 0091-7613. ^ a b "Melting Ice—A Hot Topic? New UNEP Report Shows Just How Hot It's Getting". United Nations Environment Programme (UNEP). 2007-06-04. Retrieved 2016-05-12. ^ Goudie, Andrew (September 2006). February 2019 "Global warming and fluvial geomorphology" Check |url= value (help). Geomorphology. 79 (3–4): 384–394. doi:10.1016/j.geomorph.2006.06.023. Retrieved 8 February 2019. ^ Webster, Jody M.; Clague, David A.; Riker-Coleman, Kristin; Gallup, Christina; Braga, Juan C.; Potts, Donald; Moore, James G.; Winterer, Edward L.; Paull, Charles K. (2004). "Drowning of the −150 m reef off Hawaii: A casualty of global meltwater pulse 1A?". Geology. 32 (3): 249. doi:10.1130/g20170.1.